Project 31. Photo by Olivia Blaisdell. Boston University Dance Theater, Boston, Massachusetts. 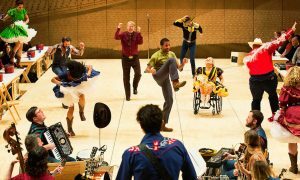 Dancing is about being in control, one could argue — of body placement in space, rhythm and quality of movement. Yet one could also say that it’s about releasing control, letting the mind get out of the way for the body and soul to take the lead. Thus, there’s a balance to strike there. Could the same be said about life? Project 31’s First Annual Winter Concert, Under Control, focused on this theme of control — inside ourselves, socially, overall in our lives and more — with its advantages, drawbacks, and pervasiveness across our lives and society. Founder and Artistic Director Kenzie Finn opened the show with a speech, thanking all for coming out and supporting the relatively new company — founded in fall of 2017, and with one other major concert under its belt. Throughout the show, Finn’s choreographic work and supporting elements were compelling and memorable, stirring the heart and the mind, with further potential to be probed and pushed. “Under Ctrl” filled the stage first, danced by the full company with apprentice Lucie Novelline. Lights came up on a large clump of dancers centerstage, limbs and joints placed such that it looked like a giant briar patch. Costumes were an attention-grabbing fiery red, dresses with unique cuts. The dancers soon moved out into the stage space, the briar patch becoming a pentagon. The music, “Control” by Shifted, offered a pulsing beat — with which the dancers moved in alignment at times, and not in alignment with at other times. A scooping action also characterized the movement — generative for vivid, diverse phrasework as well as evocative of that theme of control (gaining control by “scooping up” into one’s sphere of influence). Various dancers entered and exited the stage at various points, keeping formations and movement qualities fresh. At times, it could be difficult to see lines clearly in large groups of dancers, and I wondered if using more of the stage space could solve that problem by offering more space in between each dancer. Nevertheless, it was all quite energetic and soul-stirring. Later on came a shift: lights and backdrop shifting to a blue/purple (fading together like water colors, lighting by Matthew Cost), and the music becoming slower and more contemplative. Movement softened a bit as well, more circular shapes in the body — and formations — emerging. There was a sense of some sort of resolution, some amount of release from holding control, precision, and perfection. A melancholic feeling in the air also conveyed that working towards that achievement would be an ongoing process, certainly no kind of “done deal”. I’d wager most, if not all, audience members could relate. Next came a solo from Finn herself, “The Rules”. Dim lights came up on her at a desk, wearing a collared shirt, slacks and a tie. This was someone in the corporate world, and seemingly not happy to be there. Lights were low and dramatic. The score arose, the brooding and pulsing “The Rules” from Jeremy Bruckman, laying a foundation for Finn’s movement. Finn began to circle through her torso. Shifting quickly to the side of table and extending her leg past it, all very angular, contrasted the circular feel with which she began. She left the table before too long, even pushing off it with conviction and clarity. Throughout, she executed a clear sense of rise and fall, dynamics of high and low in space. One memorable moment was a leap in which her legs cut like scissor blades, like a ballet fouttee but stripped of a need to look perfectly graceful and “effortless”. Instead, the power behind it was clear, and pulled me right in. Another memorable movement phrase was a “coffee grinder” (a leg sweeping on the ground to “cut” the other leg out of the picture), into a plank. She then rose to turn, spotting an opposite diagonal. Clarity, power, strength, sinewy smoothness — she had it all in this phrase. Challenges she faced, but she wouldn’t let them keep her down. All throughout the work, her movement and demeanor conveyed an unease and desire to escape a confining structure — control created by “the rules”, if you will. As it concluded, the piece felt short and sweet. It packed a punch of a prevailing emotion and technical command in this short amount of time. It was just, just enough. Later in the Act came “Akathisia” — the title that of “a movement disorder that makes it hard for you to stay still…caus[ing] an urge to move that you can’t control…usually, a side effect of antipsychotic drugs,” (WebMD). All throughout, in the air was a vaguely troubling sense of something not quite right. Memorable and prescient were gestures of shaking wrists and flapping hands, with a sense of not doing so — of finding stillness — not within the dancers’ control. Rise and fall was also a clear motif in the movement, with Finn’s signature smooth turning into the floor. The moody, brooding score, Clint Mansell’s “Welcome to Lunar Industries”, supported the feeling the movement built. I wondered if more locomotive movement, more moving through the whole stage space, could have strengthened this agitated sense of not being able to keep still — yet, perhaps Finn wanted to convey a sense of internal turmoil very much only within one’s private experience, and moving all throughout the space wouldn’t have supported that feeling. Nevertheless, the work was a thoughtfully-constructed window into a challenging physical experience resulting from mental illness, calling upon empathy in the bodies of audience members to then call upon empathy in their minds, hearts, and souls. “At The Scene” was fourth in Act II, and danced by much of the company and some P31 apprentices. 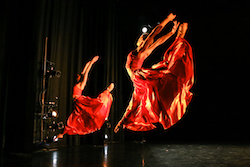 In the beginning, dancers walked in individual paths through the space. One dancer was spotlit center and moved with decisiveness. Soon dancers began facing each other and dancing with gestures reminiscent of pointing, as if blaming each other. Agitation oozed out of their movements. 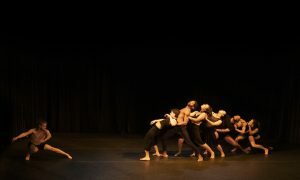 At the same time there was a sense of smooth swoop to the movement, arms in circular formations and spiraling through different levels.Through these movements the dancers came together and apart, faced each other and faced away from each other. At other points the descent to the floor was more abrupt, with a feeling like only the floor was there to support when all else had given out. 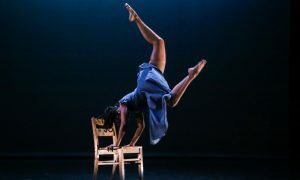 The same dancer ended in spotlight to close the piece, evoking ideas of circularity, continuity, and the truth of being alone in one’s own experience – particularly in cases of trauma and tragedy. We can’t control what happens to us in life, yet we have choices when it comes to how we react. Much of that ties into how we seek to control or manage to release from that need to control. Finn and Project 31 deftly illustrated many of the complexities involved with control in our lives, in our communities, and in our society right through the body and the art of dance (including music, lighting and costumes). I know I left the theater with much to ponder, and I’d guess it was the same for many audience members. If it can’t always answer the questions, thoughtful art can at least guide us to the questions in the first place.